As you all know by know, I love classic books. I've read a lot of different authors but I have just finished my first Jules Verne. I don't know why I put it off for so long, I think it must have been a combination of my bad memory and long list of books people keeping telling me I must read. I'm just happy I finally got around to it. My overall reaction to Twenty Thousand Leagues Under the Sea is that it is fantastic. Verne had a lot of imagination going into it and a knack for story telling. That doesn't mean I loved everything about the book, but overall it was a great read. If you like science fiction that isn't space ships and time travel, or if you're a fan of steampunk, I highly recommend this book. Now, I just want to take the time here to clarify something that I found a bit confusing: the title. At first glance, I (and I'm sure many others) thought that the title was saying that Captain Nemo's magnificent ship would be able to dive to a depth of 20,000 leagues. As I knew next to nothing about how deep the Earth's oceans are, I had no problem thinking that. But after reading the book (and some research), I found out that the deepest part of the ocean (Mariana Trench) is only 10.911 kilometers deep, which is equivalent to 1.96 leagues. Obviously, unless Verne had a great imagination, the Nautilus would not be able to reach that deep. Actually, the title means that, throughout the entirety of this story, the Nautilus would travel a total of 20,000 leagues (111,120 kilometers) while being under the ocean's surface (aka "Under the Sea). This is by no means a rant that Verne should have given his book a clearer title, just a bit of confusion I'd like to clear up. Enough of little technicalities, let's talk about the book as a whole. I won't include any spoilers here, so some of this might seem a bit vague. I'd say come back and read this again right after reading the book to see if you agree with my opinions. First, I'd like to cover what I loved about the book. As I've probably mentioned before, I love good description. I'm a very visual person and enjoy a lengthy description about how the landscape looks. Jules Verne does this very well. He gives a lot of description of the wonders of the ocean: the terrain, the fish and critters, the interior and exterior of the submarine. I could see it all in my mind. Of course, if you don't like pages of description, I'd saw it does get a little draggy after a while (more on this later). Also, I thought the basic premise of the story, as well as the initial set-up, was great. 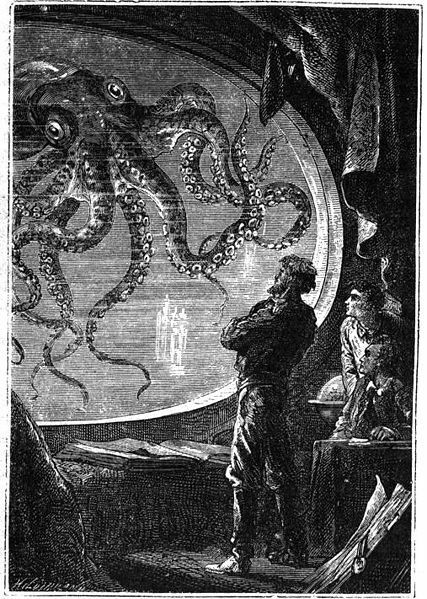 The idea of travelling around the world's oceans and discovering all the fantastic sights and animals is a great idea, but Verne adds another layer of tension and excitement by making our three companions prisoners on the Nautilus. The set up for the encounter with Captain Nemo's ship was done well. I thought it was very interesting that Verne decided to make the false assumption of a destructive animal a global affair, even into a hunting competition. That made the reveal of the man-made ship that more fantastic, especially since the only people that knew this information would never see humanity again. The characters were great as well. They felt fleshed out and different from each other. Even though some of them definitely had some similarities of interest between them, after just a few chapters you could look back on what the character said or did and think, "Yes, that is definitely what ____ would do." The characters also kept the plot going and always brought something to the table. Finally, just the imagination of Verne is wonderful. From the great speed of the Nuatilus to descriptions of parts of the globe that were still a great mystery. Verne was able to bring all of this to life and made it seem real. Of course, I didn't love all of the book. I believe that all books (with the very rare exception) have their low points. Even if I can't find anything wrong with a book, someone else will. For me, I found some of Verne's description annoying and boring. Me? Find description boring? Yes, if it happens to be dry scientific classification of animals with names I can hardly pronounce. Verne, with his love of science, felt the need to go on and on about the specific species and classification of many animals. After a while (half a page or so), it got very boring and tiring. I even skipped some of them entirely, and I usually hate skipping any part of a book. But it was not just animal classifications that got to me, Verne also talked in length about latitude and longitude, mathematics, and dry geography. It was a good thing most of these were discussed separately from each other, otherwise I would have skipped a lot more. Another thing, I felt that many of the events that occurred in the story that were intended to be high points were resolved too quickly. I have a few in mind, but I won't include any here to avoid spoilers. I just felt that the main reason I was reading was to find out how our three companions would escape Captain Nemo's ship, not for the events in between. Also, I felt the ending fell a bit short. Instead of telling us exactly what happened, the point of view character falls unconscious and later the other characters can't tell him what happend. They don't know how they escaped, so the readers are left in the dark. I just felt that there was no pay-off for the amount of anticipation I had going into seeing them escape. Once again, I'd like to say that I did greatly enjoy this book, even with it's short comings. Overall, it was a great reading experience and an interesting story. If you love classics as much as I do, Twenty Thousand Leagues Under the Sea by Jules Verne is a must. I've been meaning to read this!